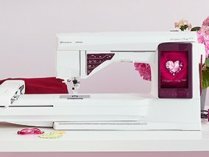 Designed and engineered in Sweden, the DESIGNER RUBY Royale™ sewing and embroidery machine offers a wide array of features to fulfill your heart’s desire. The DESIGNER RUBY Royale™ machine makes it easy and rewarding to create unique, personalized projects for your special occasions and everyday moments of love. Experience exceptional capability including an extended sewing surface for large projects, a beautifully illuminated sewing area and large Graphic Display. Comes with more than 100 stitches for endless creativity and a Decorative Tapering feature that lets you create unique embellishments. An inspirational machine that comes with more than 100 stitches, including utility, quilt, satin, heirloom and decorative stitches, to increase your creativity. A special sensor system gives you perfect fabric feed and the extended sewing surface lets you work on large projects. This machine has many practical features you will love, such as the built-in needle threader, a handy Sewing Guide Reference Chart, a hard cover for storage and an effortless one-step buttonhole. Emerald machines let you adjust your sewing speed. Plus, you decide if the needle stops in the up or down position when you stop sewing. All you need for sewing is an Emerald! If you're looking for a convenient, compact and lightweight sewing machine for travel and classes, The H|Class 100Q is for you. Perfect for those who are new to sewing and want to create trendy looks and personalized items. It's time to start something beautiful! If you are sewing on a mechanical machine or an older computerized model, you are missing out on the benefits of modern technology. Our OPAL™ 650/670 computerized sewing machines are extra-efficient with loads of built-in assistance to change the way you sew for the better! 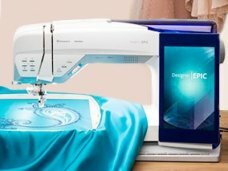 Let your Husqvarna Viking® OPAL™ sewing machine focus on delivering the best results while you relax and focus on the joy of sewing. 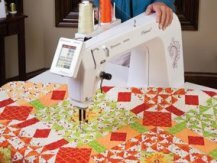 This user friendly quilting machine features easy-to-use menus and settings that can be controlled right from your machine. An onboard bobbin winder, comfortable handle design and built-in calculator enhance the quilting experience. With the ability to do 3000 stitches per minute, quilting has never been more fun…or easy! We set out to create the latest in quilting design and technology and developed a product that takes your creativity to a new level. More design capabilities and efficiency for every project. Perfect for creating heirloom quilts or using for your home quilting business. If you're passionate about quilting, this machine is essential. The enhanced iQuilt Frame combines all the great concepts of the previous model with exciting new features that enhance the Quilter’s experience. You'll love the frame's new carriage and steel rails Compatible with QuiltSewClever, Use with any sewing machine that has up to an 18” throat space. This software helps you create quilted masterpieces, from personalized quilt blocks to borders and labels. You’ll love how easy it is to easily repeat any shape or design. Preview designs on your own fabric before you start sewing. This software makes quilting a more creative and simple process.